The Toronto Blue Jays and Boston Red Sox were at Fenway Park deep into the night on Tuesday. So deep in fact, that the game ended on Wednesday. After the start of the game was delayed because of rain, the teams went to extra innings. The game didn’t end until 1:09 am local time, after a home run by Hanley Ramirez gave the Red Sox a 5-4 win in the 15th inning. But that’s not the weird part. With only Ryan Tepera left available in the bullpen, Blue Jays manager John Gibbons had to stretch relief pitcher Mike Bolsinger more than usual. It turns out, he can handle it. In the 13th inning, Bolsinger’s second on the mound, he etched his name into the history books with a baseball oddity. The 29-year-old needed three outs to push the game into the 14th inning, but it took him four strikeouts to do it. Then, he got Jackie Bradley to chase a ball in the dirt. One problem though, the ball got past catcher Russell Martin and got caught on the back screen. Bolsinger got credit for the strikeout, but Bradley wasn’t out, reaching first base on a wild pitch. …Then sat down Deven Marrero, before doing a subtle karate pose celebration. 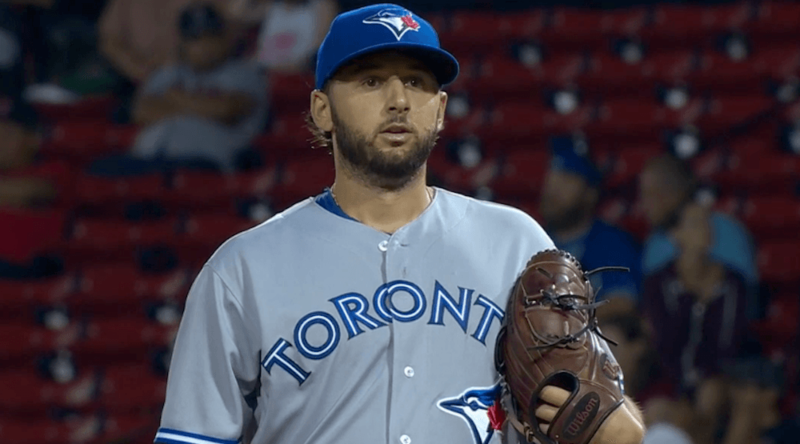 We’ll forget that Bolsinger lost this game years from now, but we might remember the night a Blue Jays pitcher struck out four batters in one inning.